Surface dyslexia or developmental dyslexia is a dyslexia subtype related to a bad visual, lexical or direct functioning (Boder, 1973). To compensate those visual deficits, these children tend to read using the phonological via. Esta entrada fue publicada en Dyslexia. Publisher: Atheneum Books for Young Readers Year of publication: 2012. 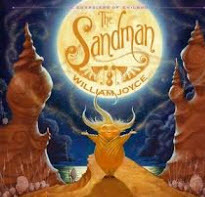 Sandman is the second picture book of a book series named The Guardians of Childhood. The Guardians of Childhood (The Man in the Moon, Nicholas St. North, Toothiana, Sandman and E. Aster bunnymund) protect children from Shadow, the King of Nightmares. The Man in the Moon needs to keep children safe at nights. He can do it alone, except when the moon is less than full and bright. For this purpose, will ask for the help of Sanderson Mansnoozie (Sandman), who flies with his shooting star making people’s dreams come true… With extraordinary illustrations, its reading teaches us that to dream and to face to our fears is the first step to overcome them. Esta entrada fue publicada en ADHD, Dyslexia, Learning disorders, Psicólogo Online, Trastornos del Aprendizaje y etiquetada como atención, attention, Children, Dr.Guilera, dreams, DreamWorks, fears, Funciones Ejecutivas, Language, literature, Memoria, nightmares, picture book, TDAH, telepsicologiainfantil.net, The Guardians of Childhood, William Joyce.